Our aim was to study the results of correction of complex foot and ankle deformities in skeletally mature patients using the Ilizarov method with either osteotomy or arthrodesis. Complex foot and ankle deformity is a multiplanar one with shortening of the foot. Different corrective procedures have been described for correction of these deformities in skeletally mature patients, such as extensive soft tissue release with capsulotomy, tendon transfer, multiple osteotomies, and arthrodesis. Acute correction with internal fixation methods has many disadvantages such as excessive shortening of the foot, risk for neurovascular bundle injury, high risk for recurrence due to extensive scar formation, and high risk for wound complications. In this study, an Ilizarov external fixator was used for correction of 25 complex foot and ankle deformities in 23 patients with either bone osteotomy, which was done in 12 feet, or arthrodesis in another 13 feet. Complete clinical correction of all feet to a plantigrade position was obtained, gait was improved in all cases, and pain was the same, improved, or completely eliminated. Partial relapse of the deformity with recurrence of symptoms occurred in three cases. The Ilizarov method of external fixation is an effective, safe, and reliable method for correction of complex foot and ankle deformities in skeletally mature patients, where correction is achieved by performing gradual distraction of foot osteotomies or arthrodesis. The foot is the weight-bearing segment of the body. It plays, together with the ankle, the most vital role in the gait. Foot and ankle deformities are common problems in orthopedic surgery; these deformities occur with congenital conditions (such as clubfoot and congenital vertical talus), neurological lesions (such as poliomyelitis, cerebral palsy, meningomyelocele, and Charcot–Marie–Tooth disease), traumatic injuries, osteomyelitis, nonunions or malunions, leg-length discrepancy (LLD), burn, and other soft tissue contractures . Foot and ankle deformities affect the gait and may cause compensatory changes in other joints, leading to knee, hip, and lower back problems. Foot deformities interfere with shoe fitting and require custom-fitted orthoses . The abnormal contact pressures cause skin problems ranging from callosities to skin ulcerations, which in turn can be complicated by infection and osteomyelitis. These problems add to the psychological distress experienced by these patients . The goal of treatment of foot and ankle deformities is obtaining stable, painless, plantigrade, and cosmetically aligned foot that allows normal or near-normal gait. Many conventional surgical procedures have been described for correction of these deformities, depending on the severity of the deformity, whether the deformity is flexible or rigid, age of the patient, and presence of muscle paralysis or joint arthritis. These surgical procedures include soft tissue release with tendon lengthening, tendon transfer, osteotomies, and arthrodesis ,. The foot and ankle deformities are usually complicated by being severe multidirectional deformities, presence of infection, extensive scar tissue formation, associated neurovascular injuries, disuse osteoporosis, and concomitant LLD. Therefore, correction of these deformities by using conventional surgical procedures has many complications such as shortening of the foot, risk for neurovascular bundle injury due to acute stretch, high risk for recurrence due to extensive scar formation, and high risk for wound dehiscence and infection ,. Ilizarov introduced a method of external fixation that revolutionized the treatment of difficult musculoskeletal problems, especially deformity correction. Regarding the three-dimensional nature of the complex foot deformity, the Ilizarov apparatus offers an effective method of correction because of the three-dimensional nature of its circular frame . This study included 25 feet (23 patients; 14 male patients, nine female patients) with complex deformities. Thirteen out of 23 patients were students, four were workers, one was an employer, and five patients had no job. All the patients were older than 12 years (age ranged from 12 to 50 years, with a mean of 20.78), and thus, the foot was considered skeletally mature. The etiology of the deformity was relapsed congenital clubfoot in eight patients (nine feet), complications of trauma in seven patients, complications of osteomyelitis in two patients, cerebral palsy in two patients, poliomyelitis in two patients, meningomyelocele in one patient (two feet), and Charcot–Marie–Tooth in one patient. The deformity was in the right foot in 12 patients, in the left foot in nine patients, and it was bilateral in two patients. All the deformities were complex (occurring in more than a single plane and involving more than a single tissue) and fixed bony deformities. Its duration ranged from 1 to 32 years (mean was 11.7 years). Thirteen of these deformities had no previous operations, whereas 12 of them had undergone previous operations (ranged from one to four operations). The deformities in 10 feet were in the form of equinus ankle, varus heel, cavus, adducted forefoot, and supination. The same deformity with arthritis was present in three feet. Ankle deformity (equinus) with tibiotalar arthritis was present in four feet, hindfoot deformity (varus heel) with subtalar arthritis was present in one foot, metatarsal abduction with Lisfranc arthritis was present in two feet, rigid flatfoot (valgus heel, pes planus, forefoot abduction, and pronation) was present in one foot, anterior cavus deformity was present in one foot, equinus with mixed cavus was present in two feet, and in one foot the deformity was in the form of neglected ankle dislocation and mixed cavus with arthritis. The Ilizarov method was used for correction of deformities in all cases. The apparatus was constructed intraoperatively in all cases in the form of three components: leg component, hindfoot component, and forefoot component. Connection between these components was tailored in every case, depending on the deformity being corrected and the condition of the local bone. Proximal extension of the apparatus was done for correction of associated LLD in two patients. V-shaped osteotomy [Figure 1] was carried out in 11 feet (10 patients) for correction of equinocavovarus deformity [Figure 2] and [Figure 3] in 10 feet, and for correction of flat-valgus-pronation deformity in one foot. Cuneiform-cuboid osteotomy was carried out in one case for correction of anterior cavus deformity. Ankle fusion (tibiotalar arthrodesis) was carried out in four cases for correction of equinus deformity where the ankle was arthritic and painful on weight bearing, and extension of the frame with proximal tibial corticotomy was carried out in one of these cases for correction of LLD. Subtalar arthrodesis was performed in one case that had painful arthritic subtalar joint for correction of varus heel. Lisfranc joint arthrodesis was carried out for correction of deformities in two cases having post-traumatic metatarsus abductus with arthritis. Ankle and Chopart's joints arthrodesis with calcaneal osteotomy was done in one case that had neglected dislocated ankle, mixed cavus, and arthritis [Figure 4] and [Figure 5]. In this case, extension of the frame with proximal tibial corticotomy was carried out for correction of LLD. Triple arthrodesis was carried out for correction of deformities in five feet (four patients); in three feet, the deformity was equinocavovarus with arthritis [Figure 6] and [Figure 7], whereas in others the deformity was equinus with mixed cavus. Figure 1: Intraoperative photograph showing V-shaped osteotomy. Figure 2: Preoperative photographs and radiographs of a relapsed congenital clubfoot (equinus ankle, varus heel, adducted forefoot, and cavus supinated foot). Figure 3: Photographs and radiographs of a relapsed congenital clubfoot after correction by V-shaped osteotomy using the Ilizarov method. Figure 4: Preoperative photographs and radiographs of complex foot and ankle deformity due to distal tibial osteomyelitis during infancy (neglected dislocated ankle and mixed cavus foot). 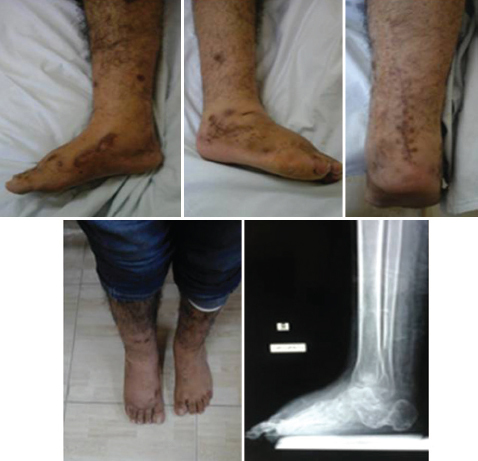 Figure 5: Photographs of the previous case after correction by ankle and Chopart's joints arthrodesis with posterior calcaneal osteotomy using the Ilizarov method. Figure 6: Preoperative photographs and foot print of spastic hemiplegic cerebral palsy (equinus ankle, varus heel, adducted forefoot, and cavus supinated foot). Figure 7: Photographs and foot print of spastic hemiplegic cerebral palsy after correction by triple arthrodesis using the Ilizarov method. On the 4th day after surgery, distraction of osteotomies was initiated in a rate of 1 mm/day, divided in four time intervals. The goal of this distraction was to create a space needed for corrective movement of the bony segments and to prevent premature consolidation. After 1 week (10 days postoperative), radiographs were taken to observe how the distraction is progressing and to look for subluxations of the tibiotalar and other joints. Thereafter, the corrective regimen was initiated (in cases of osteotomies and in cases of arthrodesis that were not fully corrected intraoperatively) according to individual parameters, which include the extent of deformity, the biological response, and the occurrence of skin disturbances. Distraction was stopped when correction was achieved. None of the patients were able to bear weight in the apparatus over the operated foot as the frame itself extended beyond the sole of the foot, but single limb weight bearing over the sound foot was encouraged starting one week postoperatively. The Ilizarov apparatus was removed when there was radiological evidence of consolidation of osteotomy or union of arthrodesis. All patients wore a below-knee cast for 8 weeks of weight bearing after removal of the frame. Results were evaluated according to the American Orthopedic Foot and Ankle Society (AOFAS) clinical rating scales, which are widely used and are applicable to a wide variety of foot and ankle disorders . The AOFAS clinical rating scales constitute a scoring system consisting of subjective and objective components converting them into a numerical rating system. The items being assessed are classified into three major categories: pain, function, and alignment. The total score in the AOFAS scoring scales ranges from 0 to 100, with higher scores indicating lesser impairment . There are no radiological factors included in this score . Analytic statistics, such as the c2-test, Mann–Whitney U-test, paired t-test, and Wilcoxon signed-rank test. Complete clinical correction of all cases to a plantigrade position was obtained. Gait was improved in all cases, and pain was the same, improved, or completely eliminated. Partial relapse of the deformity with recurrence of symptoms occurred in three cases, which was managed by triple fusion in two of them and dorsolateral wedge osteotomy in the other. The total preoperative score for all cases (25 feet) according to AOFAS clinical rating scales ranged from 15 to 75, with a mean of 43.48 and SD of 14.11, whereas total postoperative score ranged from 58 to 97, with a mean of 82.32 and SD of 11.86 [Table 1]. This is considered high significant improvement (P < 0.001). The time needed for achieving full correction of the deformities ranged from 0 to 8 weeks, with a mean of 4.12 weeks. When arthrodesis was done, full correction could be achieved intraoperatively (four feet). The period of frame application ranged from 3 to 7 months, with mean 3.64 months. The period of follow-up after removal of the apparatus ranged from 6 to 38 months; the mean for this period was 14.28 months. There was no complication in 11 feet, whereas complications were encountered during correction of deformities in 14 feet. Pin site problems occurred in eight cases and were managed according to the protocol of Paley . Foot pain and edema during correction occurred in seven cases and were managed by elevation, medical treatment, and decreasing the rate of distraction. Clawing of the toes (due to the action of long flexors during correction) occurred in two cases (where pinning of the toes was not done), which was managed by intraoperative percutaneous tenotomy at the time of removal of the Ilizarov apparatus. Subluxation of the metatarsophalangeal joint of the big toe occurred in one case, which was managed by intraoperative reduction and K-wire fixation at the time of Ilizarov removal. Premature union of osteotomy occurred in one case and was managed by intraoperative revision of osteotomy. Metatarsal overcrowding with foot paresthesia and sluggish capillary circulation occurred in one case, which was managed by intraoperative revision of metatarsal wires. Poor regenerate of proximal tibial corticotomy (done for lengthening to correct LLD) occurred in one case, which was managed by bone graft. Obstruction of correction due to impingement of the corrective component of the frame over the skin occurred in one case, which was managed by revision of the junctions between the corrective component and other parts of the frame. Skin sloughing occurred in one case and was managed by using skin graft. 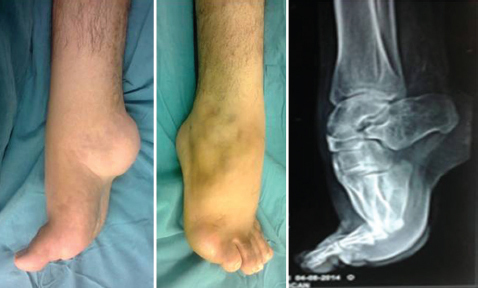 Reflex sympathetic dystrophy occurred in three cases where the patients were complaining of foot pain, edema, joints stiffness, and inability to walk. Radiologically, there was osteopenia. It was managed by using aggressive physiotherapy and medical treatment in the form of calcium, calcitonin hormone, NSAIDs, neurotonics, pregabalin, and antiedematous drugs. In this study, patients were evaluated according to AOFAS clinical rating scales and the results were classified into four groups: poor result if the score was 70 or less (three feet), fair result if the score was 71–80 (five feet), good result if the score was 81–90 (11 feet), and excellent result if the score was 91–100 (six feet). Paley  evaluated his own results according to three criteria: gait, foot deformity, and pain. Gait was judged to be improved, unchanged, or better in the postoperative status than in the preoperative status. Foot deformity was judged (clinically and radiologically) postoperatively as plantigrade or not. Pain was judged postoperatively to be present or absent. A satisfactory result indicated plantigrade foot (clinically and radiologically), improved gait, and no pain. Failure to achieve any of these goals was considered an unsatisfactory result. Out of 25 cases, Paley  reported 22 satisfactory results and three unsatisfactory results at the time of follow-up evaluation. In this study, similar results were obtained; three out of 25 cases had poor results (which were considered unsatisfactory results). De la Huerta  reported satisfactory results in the 12 cases of his series (seven patients). In the series of Kocaoglu et al. , a plantigrade foot was achieved in 21 out of 23 cases; gait was improved in all cases. In the series of Hosny , the results were graded as good, fair, or poor. If the patient was satisfied with a painless plantigrade foot, full correction of the deformity, and the ability to ambulate without limitation, the result was rated as good. If there was mild pain, which did not disturb daily activities, or mild deformity, which did not interfere with the use of a normal shoe, and the patient was satisfied and could ambulate long distances, the result was rated as fair. The recurrence of deformity, marked pain, significant limitation of activity, or unsatisfaction of the patient meant a poor result. Out of 23 feet, Hosny  reported 20 good results and three fair results. El-Mowafi  achieved plantigrade foot in 18 out of 20 cases of foot deformity with gait improvement and no pain. In another series by El-Mowafi et al. , plantigrade foot was achieved in 30 out of 35 cases, with mild residual equinus and varus in five cases; gait was improved with no pain in all cases. Fadel  reported that all patients of his series (33 patients with 34 deformed feet) were satisfied with plantigrade feet at the time of the Ilizarov removal. During follow-up, three cases developed partial relapse. In a series of 20 cases, Emara K, et al. achieved plantigrade stable foot in all but one case. Emara et al. performed correction in 56 patients with 59 deformed feet. The cases were classified into two groups; the first included 29 cases that were corrected by using the Ilizarov method only without internal fixation, and the second included 30 cases that were corrected by using the Ilizarov method followed by internal fixation. Results were evaluated based on the clinical criteria established by Ferreira et al. for the treatment of neglected clubfoot using the Ilizarov method: achievement of painless foot and ankle, capacity to walk on a plantigrade foot, capacity to wear conventional shoes, absence of significant recurrence of the original deformity after a follow-up period of at least 2 years, and patient satisfaction with the final appearance of the foot. When all these criteria were met, the result was considered good. If only one of these criteria was not met, the result was considered fair. If two or more of these criteria were not met, the result was considered poor. In the first group, Emara et al. reported 21 good results, five fair results, and three poor results, whereas in the second group, he reported 21 good results, six fair results, and three poor results. The results of the two groups were similar, and the total results are comparable with our study. The Ilizarov method of external fixation is an effective, safe, and reliable method for correction of complex foot and ankle deformities in skeletally mature patients. This method offers many advantages, especially its unique characteristic is being adjustable over a long period of time. Correction by arthrodesis is better than osteotomy because of a shorter fixation period and no recurrence. The main limitation of the Ilizarov method is the original status of the foot; a stiff deformed foot that is corrected to a plantigrade foot is still a stiff plantigrade foot. Kirienko A, Villa A, Calhoun JH. Ilizarov technique for complex foot and ankle deformities. New York: Marcel Dekker; 2004. Perry J. Gait analysis, normal and pathological function. Thorofare, NJ: Slack Inc.; 1992. Shalaby H, Hefny H. Correction of complex foot deformities using the V-osteotomy and the Ilizarov technique. Strategies Trauma Limb Reconstr 2007; 2:21–30. Burns JK, Sullivan R. Correction of severe residual clubfoot deformity in adolescents with the Ilizarov technique. Foot Ankle Clin 2004; 9:571–572. Steinwender G, Saraph V, Zwick EB, Uitz C, Linhart W. Complex foot deformities associated with soft-tissue scarring in children. J Foot Ankle Surg 2001; 40:42–49. El-Mowafi H, El-Alfy B, Refai M. Functional outcome of salvage of residual and recurrent deformities of clubfoot with Ilizarov technique. Foot Ankle Surg 2009; 15:3–6. Birch JG, Samchukov ML. Use of the Ilizarov method to correct lower limb deformities in children and adolescents. J Am Acad Orthop Surg 2004; 12:144–154. Kitaoka HB, Alexander IJ, Adelaar RS, Nunley JA, Myerson MS, Sanders M. Clinical rating systems for the ankle-hindfoot, midfoot, hallux and lesser toes. Foot Ankle Int 1994; 15:349–353. Ibrahim T, Almoghera B, Azzabi M, Alistair JB, Grahame JT, Dipen KM. Reliability and validity of the subjective component of the American Orthopaedic Foot and Ankle Society clinical rating scales. J Foot Ankle Surg 2007; 46:65–74. Guyton GP. Theoretical limitations of the AOFAS scoring systems, an analysis using Monte Carlo modelling. Foot Ankle Int 2001; 22:779–787. Paley D. Problems, obstacles, and complications of limb lengthening by Ilizarov technique. Clin Orthop 1990; 250:81–104. Paley D. The correction of complex foot deformities using Ilizarov's distraction osteotomies. Clin Orthop 1993; 290:97–111. De la Huerta F. Correction of the neglected clubfoot by the Ilizarov method. Clin Orthop 1994; 301:89–93. Kocaoglu M, Eralp L, Atalar AC, Bilen FE. Correction of complex foot deformities using the Ilizarov external fixator. J Foot Ankle Surg 2002; 41:30–39. Hosny GA. Correction of foot deformities by the Ilizarov method without corrective osteotomies or soft tissue release. J Pediatr Orthop B 2002; 11:121–128. El-Mowafi H. Assessment of percutaneous V osteotomy of the calcaneus with Ilizarov application for correction of complex foot deformities. Acta Orthop Belg 2004; 70:586–590. Fadel M. Versatility of Ilizarov external fixator in management of foot and ankle deformities. J Orthop Traumat 2005; 6:63–68. Emara K, El-Moatasem H, El-Shazly O. Correction of complex equino-cavo-varus foot deformity in skeletally mature patients by Ilizarov external fixator versus staged external-internal fixation. Foot Ankle Surg 2011; 17:287–293. Ferreira RC, Costo MT, Frizzo GG, Fonseca Filho FF. Correction of neglected clubfoot using the Ilizarov external fixator. Foot Ankle Int 2006; 27:266–273.